I am broadly interested in the conservation of taxa vulnerable to anthropogenic disturbance, particularly climate change, urbanization & pollution, and habitat loss. I use theory from spatial and behavioral ecology to describe threats to wildlife and explore mechanisms of anthropogenic disturbance. As many seabird species are in decline and vulnerable to disturbance, they are an ideal taxa for studying anthropogenic change. For my PhD research, I study seabirds as contaminant biomonitors of North Pacific waters. As a part of a collaborative project with researchers at San Jose State University, UC Santa Barbara, and Oregon State University, I track and sample western gulls (Larus occidentalis) at five sites in coastal California and Oregon to compare gull contaminant loads with foraging patterns. I also use targeted and non-targeted techniques in analytical chemistry to examine legacy contaminants in seabirds that nest in the Southern California Bight as well as comprehensive organic contaminant loads from the tissues of three North Pacific albatross species. Worldwide, there are numerous restoration and management efforts with the goal of seabird population recovery. The application of my research can influence conservation efforts that focus not only on recovery, but also prevention of population decline of threatened taxa. Clatterbuck CA, Lewison RL, Dodder N, Zeeman C, and Schiff K. 2018. Seabirds as regional bioindicators of legacy toxicants on an urbanized coastline. Science of the Total Environment 619-620C, 460-469. Shaffer SA, Cockerham S, Warzybok P, Bradley R, Jahncke J, Clatterbuck CA, Lucia M, Jelincic J, Cassell A, Kelsey E, and Adams J. 2017. Population-level plasticity in foraging behavior of western gulls (Larus occidentalis). Movement Ecology 5:27. Clatterbuck CA, Young LC, Vanderwerf EA, Bower GC, Naiman AD, and Shaffer SA. 2017. Data loggers in artificial eggs reveal egg-turning behavior varies on multiple ecological scales in seabirds. The Auk 134:432-442. Clatterbuck CA, Lewison RL, Dodder N, Zeeman C, and Schiff K. 2016. 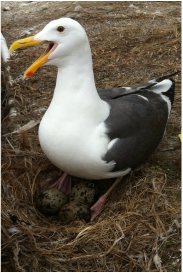 Contaminant bioaccumulation in seabird eggs of the Southern California Bight. Technical Report #944, Southern California Coastal Water Research Program. Shaffer SA, Clatterbuck CA, Kelsey EC, Naiman AD, Young LC, VanderWerf EA, Warzybok P, Bradley R, Jahncke J, and Bower GC. 2014. As the egg turns: Monitoring egg attendance behavior in wild birds using novel data logging technology. PLoS ONE 9(6): e97898.